The Bridgwaye Inn was built before the American Revolution. Originally it was called Ye Surprise Inn, it provided comfortable relaxation for those traveling from Plymouth to Scituate. Located by the Whites Ferry, carrying passengers across the South River, the Inn became a natural resting place for travelers. 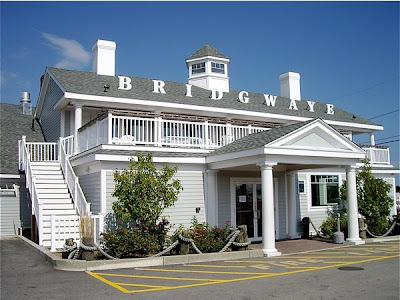 When the ferry was replaced with a bridge, the name changed to The Bridgwaye Inn. 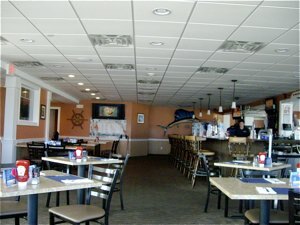 The Polcari's Bridgwaye Inn is located in the coastal community of Humarock in Scituate MA. Humarock is a charming community hidden behind a barrier island on the Boston south shore, popular as a summer resort, with beaches attracting swimmers and surfers. Beautiful as can be, you may not get there without your own car. 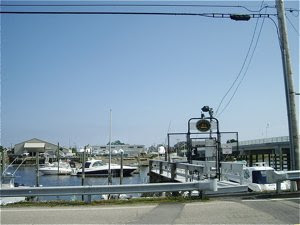 Even if you travel by the Greenbush Line to the end station it is a good stretch to Humarock. So for those of us relying on public transportation, getting to Polcari's Bridgwaye Inn is out of the question, unless you have a cousin in the neighbourhood, that is! Good service, as would be expected, at lunchtime a day in September after Labour Day. We were alone and were given all the attention from a sweet waitress. We ordered and were served without any delay. Considering the long history of the house, I have to admit I expected that the owners would have created an interior underlining the age of the house. The Polcari's Bridgwaye Inn could have been any of the countless restaurants along the coast. I have, in fact, seen more interesting interiors in many newer, contemporary restaurants that reflects the spirit of Northern New England better. Interior looked more like a cheap diner - peach coloured walls, modern grey tiles on the ceiling, comfortable white and grey chairs and tables. A good thing it has a spacious interior with much room between the table. The food at Polcari's Bridgwaye Inn was excellent and reasonably priced. 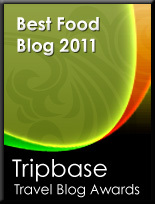 You may choose from a wide variety of fish, chicken and meat specialties, salads, pizzas and desserts. I ordered a bowl of Soup de Jour at $ 4,49 followed by Broiled Seafood Platter priced at $15.99. 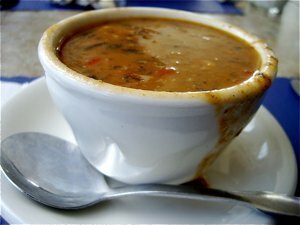 A cup of thick soup with vegetables and black beans, flavoured with cajun spices. Very "rustic" presentation, some of the soup had been poured out of the edge of the white china bowl. The Soup de Jour had large chunks of different vegetables and soft spicy black beans. Good balance and additional heat from the hot Cajun spices. This dish is based on traditional New England fish pie recipes, i.e. 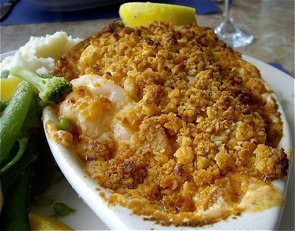 different seafood - here scallops, scrod, shrimp and sole topped with seasoned bread crumbs. A huge portion, that I had to make a choice on what to eat. I decided to concentrate on the fish and vegetables. Delicious!! Crisp, hot breadcrumbs and perfectly prepared seafood, scallops raw in the middle, shrimps firm, but not tough and fish firm and flaky. Vegetables served "al dente"
Well seasoned, salt, pleasant sweetness from the breadcrumbs and served with a lemon to add that necessary acidity. The Polcari's Bridgwaye Inn is another of those New England restaurants out of bounce for those of us who does not drive, located in a charming coastal community and with a long and dramatic history. 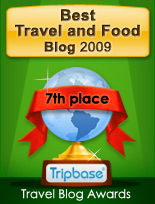 It has certainly not used the historic potential the Inn has to create a unique dining experience. The place and the interior cries out for more character, and the presence of this would have improved the score considerably. The service and food at The Polcari's Bridgwaye Inn, however, is reasonably priced and delicious and deserves its BBBBB- rating, and the main dish was scrumptious. My complements to the chef.